In the App Center, our partner Univention provides a growing number of applications from different manufacturers. All programs can be installed and set up with just a few clicks. They’ve also integrated our Open Source backup solution: Bareos is licensed under AGPLv3 and specializes in heterogeneous IT landscapes. So, if you’re running UCS, the App Center provides you with a professional backup solution for your Windows and Linux machines in your UCS domain. Bareos (Backup Archiving Recovery Open Sourced) is a cross-network Open Source backup solution that preserves, archives and recovers data from all major operating systems (Linux, Windows, macOS, FreeBSD, AIX, HP-UX, and Solaris). Bareos works with different storage media, including hard disks and tape drives. It also connects to various cloud services. It’s possible to define schedules for full, incremental, and differential backups. 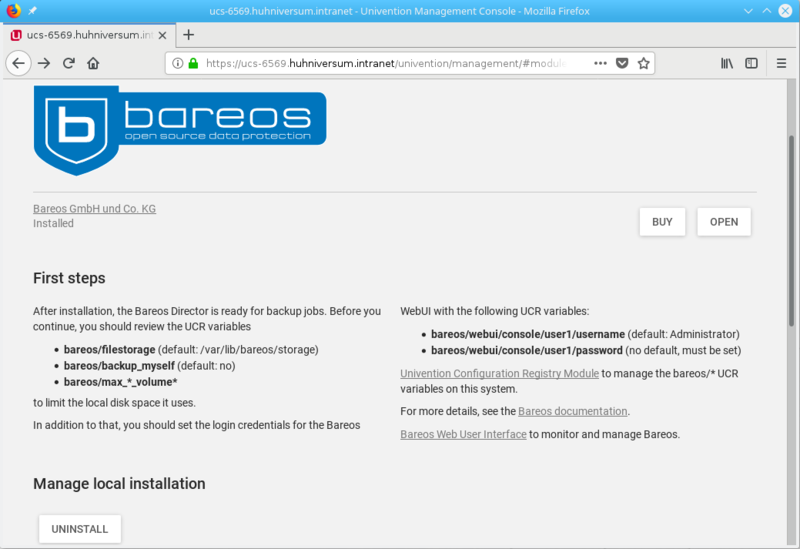 A multilingual web interface (the Bareos Web UI) allows you to access and monitor all Bareos components, as well as restore your data. 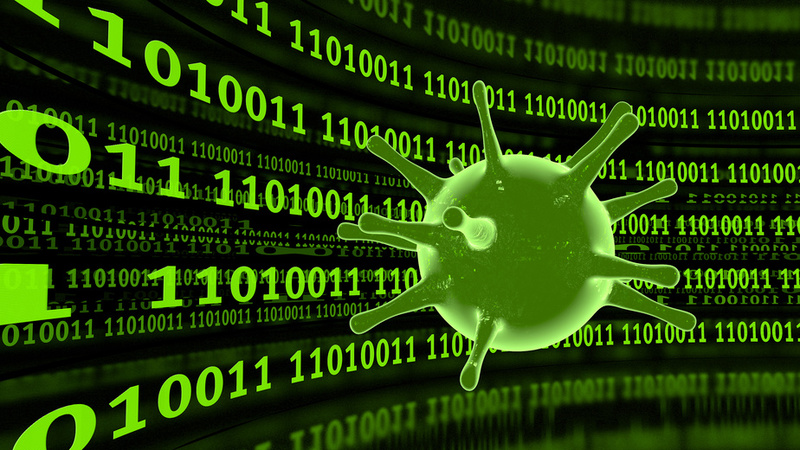 Don’t let malware take you hostage! 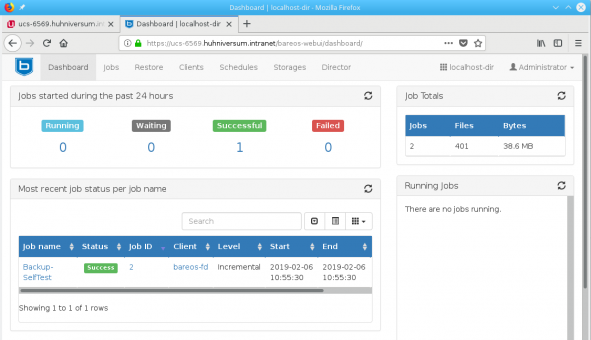 In this article, Maik Außendorf explains how to back up data from Linux and Windows machines centrally with Bareos and restore them in case of disaster. Select Bareos in the App Center and click on Install. After a short time UCS will notify you that the Bareos director is ready for backup jobs. Before you activate the backup application on the clients, you should adjust a few UCR variables. The Univention Configuration Registry (UCR) is the central configuration tool that saves you the hassle of having to use a text editor for modifying the configuration files. bareos/filestorage: Location for the backup(s) (the default is /var/lib/bareos/storage on the server); please specify your backup media and make sure that there is enough space. bareos/backup_myself: This variable determines whether Bareos should back up the server itself. The default value is no; change it to yes to include the UCS server in your backup concept. 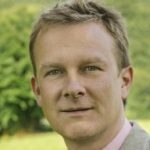 There is no need to change the default values of the variables bareos/max_*. They define the maximum size (in GByte) and the number of full, incremental, and differential backups. Every time you select the button Save in the Edit UCR Variable dialog box, the changes are written to the corresponding configuration file (in the /etc/bareos directory). Setting up the Bareos clients on the computers in the UCS domain is also easy. The current version (Bareos 17.2.6, UCS 4.2 and 4.3) only supports Windows and Linux. 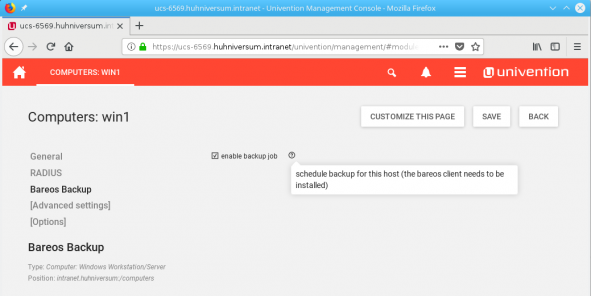 To add a new client to your backup plan, go to the Univention Management Console (UMC), select Devices and then Computers. Click on a machine’s name in the list to adjust its settings. The menu on the left side should show the entry Bareos Backup in the General section. Next, select the checkbox enable backup job on the right. After you’ve clicked Save, new configuration files for the Bareos Director and for the Bareos File Daemon are automatically created. All that’s left to do: Install the Bareos File Daemon on the Windows or Linux computer and transfer the configuration file from the UCS computer to the client. The configuration file is stored in the /etc/bareos/autogenerated/clients directory on the UCS server. The file name contains the computer name used in the UCS Management Console. If you need more information on the Bareos File Daemon and how to set up client packages on Windows and Linux machines, please have a look at the how-to on our community website. 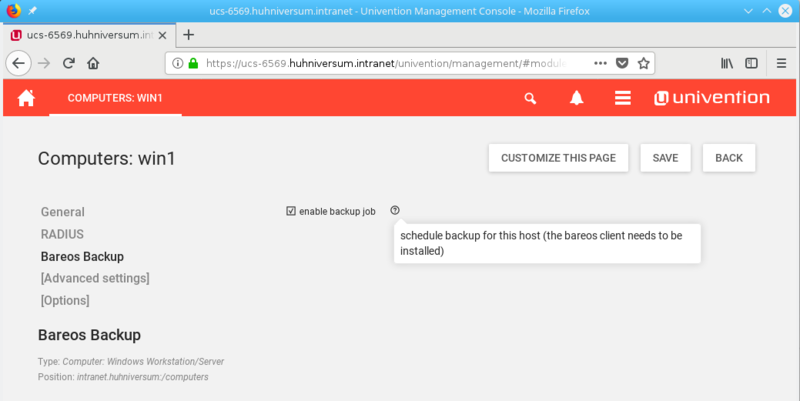 The Bareos installation via the Univention App Center automatically sets up the web interface that lets you monitor the backup software as well as restore your data. (Please note, that the current version of Bareos Web UI does not allow to define new backup jobs or schedules.) You can get to the web interface via the UCS portal. To log in, enter the user name and password that you stored in the UCR variables. The Bareos company also offers subscription and support, and to purchase one of our backup plans, simply click on Buy in the Univention App Center. You can find more information about the Bareos services on our website.